Today I am thankful for this day. I have survived another year to become 27. This has been the most amazing year of my life, that little monkey that is MINE has made it the best year possible. But I really am thankful for being able to spend 25 of those years celebrating my birthday along with my Papa. I was his birthday gift. I loved sharing my birthday with him. It has been really rough without him these past two birthdays. I can't call him to say Happy Birthday for him to say it back. I feel bad because I feel like when people think of my birthday they remember his birthday, and it is a reminder he is not here to celebrate. I prayed to him to have Eliza come on our birthday last year, I am thankful he did not listen to that prayer, she would have been born way too soon. I know she threw him a killer birthday party in Heaven though. My Papa passed away on March 4th 2010 at 225pm. We were all in the room with him, holding his hand, it was so peaceful, he didn't struggle, it was his time. Grief can awaken us to new values and new and deeper appreciations. Grief can cause us to re-prioritize things in our lives, to recognize what's really important and put it first. Grief can heighten our gratitude as we cease taking the gifts life bestows on us for granted. Grief can give us the wisdom of being with death. Grief can make death the companion on our left who guides us and gives us advice. None of this growth makes the loss good and worthwhile, but it is the good that comes out of the bad..
My Papa was a kind and thoughtful man, at times a man of few words, but you always knew he cared, and everyone’s happiness came before his. He would not want us to focus on the sadness of his death, but instead look at the happiness we still have in our lives. He would want us to look at each other and appreciate what we have together and what we hope to make better. I have much comfort in the good feelings my memories give me. I remember when I was a little girl, spending almost every Saturday night with Nani and Papa. We would always get pizza and spaghetti for dinner and watch TV together. I would find myself wandering in to watch COPS with Papa, instead of the shows Nani and Jaymi would watch. Sometimes I wonder if I really liked that show, or if it was just being able to sit in the den with him, I still watch that show every Saturday night. Most Saturday’s, after dinner, Jaymi, Nani and I would enjoy doing a puzzle. As the time went by Nani would usher us off to bed with the promise we could finish the puzzle in the morning. I was always amazed when I woke up and half the puzzle was done. Papa would stay up for hours, alone, working on the puzzle. He really enjoyed doing them, but was never so selfish to finish, he always left the last pieces for us. Papa was always playing with us, whether it was with rides on the tractor in the yard, or riding his tandem bike. I’m sorry you always had to do all the pedaling, my feet didn’t always reach. Thank you for letting us do pretty much whatever we wanted…building forts with the couch cushions, dressing your dog up like a baby, even dying and cutting Nani’s hair. My favorite memory of Papa will forever be going to Lion’s games with him. When I was younger the guys would go to the football game on Thanksgiving and the girls would go to a movie. For years I would ask my dad why I couldn’t go but there just weren’t enough tickets. After the unfortunate passing of my Uncle Mike’s friend Paul, I finally got that golden ticket. I used to be SO embarrassed; Papa would sing the national anthem and Lions Victory song louder than anyone in the stadium. I swear everyone stared at me! As the years went by Papa got 2 tickets instead of 4 and I wasn’t able to go to the games as much. This past season Uncle Mike wasn’t able to go to a game and Papa didn’t have a ride. Nani called to see if Mark, my husband, would want to take Papa, UM HELLO?? Did we forget my last paragraph?? I WANT TO GO. The fateful day came, and I hadn’t been that excited in years. We got to the game and I couldn’t wait for the national anthem to start, so I could sing it with him. I wasn’t very optimistic that I would be able to sing the Lion’s Victory song, but they scored a few times and we were able to enjoy it. I have some good news for you though Papa, Uncle Mike let me take over your season ticket, so I will be there every game singing loud and proud just for you. Papa, I will miss your bear hugs, and the way you always greeted me, “Kalyn Dormaier, how the hell are ya”. You were a wonderful role model in my life, and a great friend. I do have one confession though, I used to take pennies out of the glass jug, so when I am up beside you, be sure to remind me that I owe you quite a few pennies. I hope you accept that as gratuity for all the wonderful memories that you gave me. 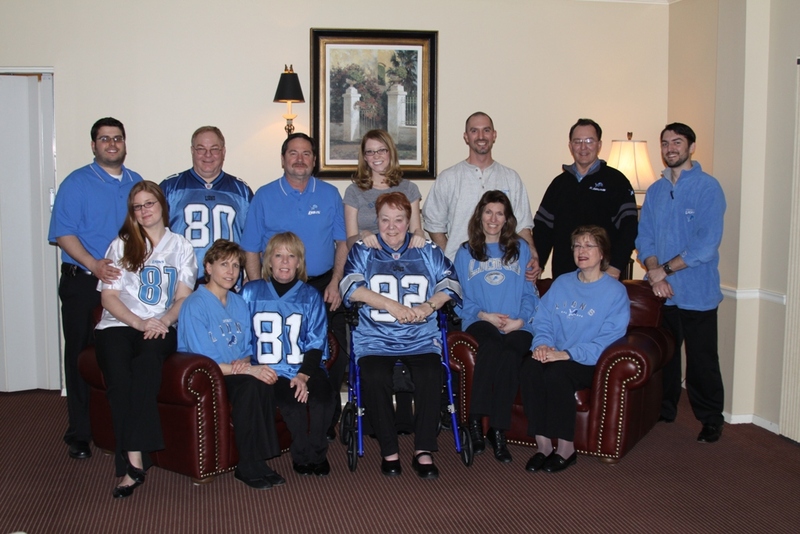 My Papa sure loved his Lions Football...we all wore Lions' shirts for him at his funeral. Happy Birthday Papa, thank you for all you have done from above. We know you are watching us...Eliza points to you everyday. This video is from when Eliza wasn't even 2 months old. She would stare at this decorative tree in our family room and smile and laugh at it forever. My Papa used to tell my Grandma she drove him so crazy he was going to climb a tree...he found one.